Core Memory was the main form of random access memory (RAM) in computing for almost 20 years, between 1955 and 1975. It used tiny magnetic rings, or cores, with wires running through the centre and because the cores are so small seamstresses were used to thread the wires through the cores! When a current was passed through the wires, the core could be magnetised in two different directions (clockwise or anticlockwise) to represent either a one or a zero. Each core therefore represented one ‘bit’ of digital information. Multiple cores were wired up together to form ‘planes’ with the wires arranged in a criss-cross pattern. Each core could be isolated and specifically magnetised by passing a current through the correct wires. How much has memory technology changed since core memory? 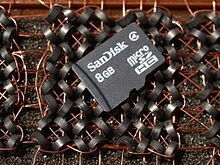 This MicroSD card in the picture below uses semi-conductor transistor technology and has a capacity of 8 gigabytes. That’s 8 billion bytes of information, or 64 billion ones-or-zeros. 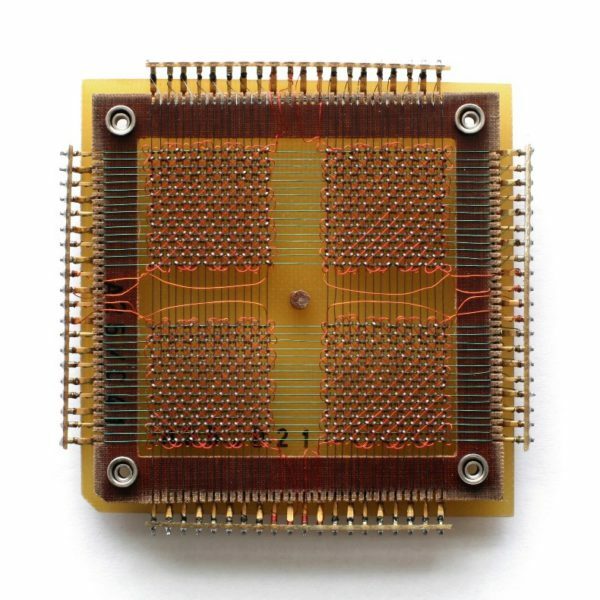 It rests on a section of magnetic-core memory that uses 64 cores arranged 8 by 8, to hold just 8 bytes. That is over a billion times more information. The MicroSD card measures a tiny 15mm x 11mm, or 0.000165 square metres. If it used core memory technology to provide its 8 GB of memory, it would have to be 165,000 square metres in size, or about 632 tennis courts. Give or take a byte or two.